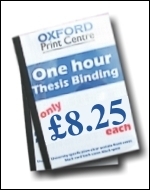 We offer a soft binding service for examiner’s copies guaranteed in one hour even on submission days. Soft binding is to University specification, we can bind up to 300 pages in one volume, if your thesis is larger than this it is advisable to bind in two volumes, make two cover pages with volume 1 and 2 clearly marked on each. It is best to split the thesis at the appendices or at the beginning of a new chapter. Soft binding costs £8.25 excluding printing. If you have left your viva submission until the last minute. Don’t panic, binding it really takes only one hour! Hard binding for deposit in the Library, University departments and your personal copies. 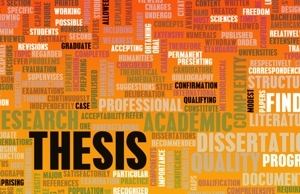 Expert craftsman binding of your thesis with the care that your thesis deserves, to last for many, many years. We offer an efficient distance service so you can email your thesis and we will print, bind and deliver on your behalf. 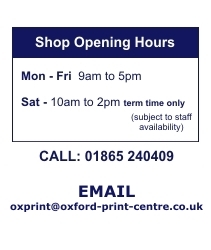 Email your file to oxprint@oxford-print-centre.co.uk and leave the rest to us.